The world is changing quickly, with emerging technologies leading the way. Nowhere has this rapid change been more evident than in the way that we consume our favorite video content. The rapid migration away from linear TV, and toward streamed and on-demand content, has posed significant challenges for video advertisers as Cable networks continue to lose market share. PeerLogix(OTCQB: LOGX) is solving this problem with a cutting-edge Data/Audience Discovery Platform for the OTT/streaming landscape. Back when ‘television’ meant the same thing to everybody, ‘television advertising’ was where the vast majority of large companies would spend their ad budgets. It made sense, of course. If you wanted to captivate a large targeted audience, you could simply use data surrounding who watched what shows and pick advertising slots to match. Today, however, there is an entire ‘television landscape,’ with many different viewing options. for consuming video content. In this new fragmented world of devices and content, advertisers are seeking a trusted method of rediscovering and reunifying the audiences lost to this fragmenting TV landscape. 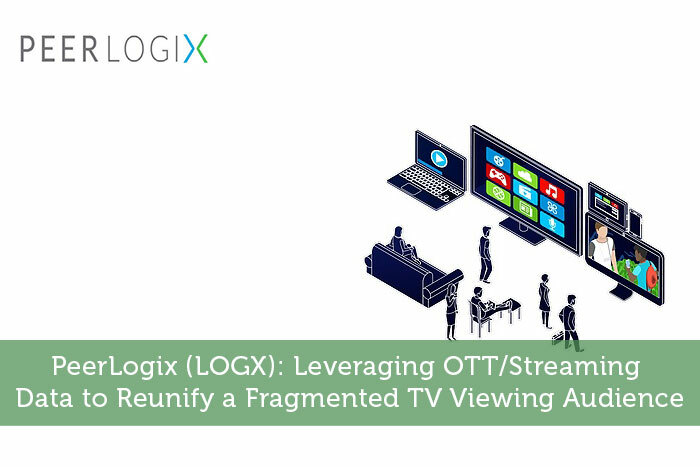 PEERLOGIX (OTC LOGX) is the go-to audience discovery platform for those advertisers hoping to make sense of the evolving OTT/streaming TV ecosystem. With a library of over 4 years of streaming video data and powered by a patent pending technology platform that collects and catalogs real-time OTT data, PEERLOGIX is able to deliver the entire spectrum of ‘cord cutters’ as targeted advertising audiences. PeerLogix provides actionable OTT/streaming viewership data to brands and agencies so they can continue to communicate with households that prefer streaming services rather than linear TV. The platform developed by LOGX is second to none in the industry. Not only does the company offer a historical library of data on more than 170 million households, it also provides advertisers with real time monitoring to ensure that their ads are reaching the right eyeballs today. PeerLogix captures viewership data in real-time by sitting directly ‘in the video stream,’ acting as a content distribution network for a vast majority of long-tail OTT networks. The company seems to have created an all-in-one platform that enables high level advertisers to access an audience that has seemed out of reach since cords started to be cut. Recent headlines are an obvious indicator of interest being shown in the OTT/streaming space by the biggest of media companies. NBC Universal is known to be exploring numerous models for its entry in to the space and last week’s announcement that Viacom will buy ad-supported streaming startup Pluto TV for $340 million in cash is about as clear a signaler of the coming migration of content (and therefore revenue) that will be following the underlying shift of viewing habits that is already afoot. We’ve all heard that there is tremendous value in big data. So, for me to say it, it’s not going to surprise you. However, looking at the actual figures of the value in the data industry might. According to Statista, the data industry is expected to be valued at $49 billion in 2019. By 2025, that number climbs dramatically to $90 billion. Why are these figures so big? Because advertisers are willing to spend more money today than ever before to understand their audiences, and experts believe that this trend will continue. Moreover, it’s worth mentioning that no one has data that is quite like the data that PeerLogix has to offer. Noticing a trend toward cord cutting, LOGX was one of the first companies to recognize the value of OTT/streaming video audience data. The company has also partnered with various sources of data, compiling them all together to create a data set that’s like nothing in the industry. So, what we have here is a company that has exactly what advertisers want, at a time when advertisers are more willing to spend on it than ever. In my opinion, there’s tremendous value in that. The takeaway for investors is a very simple one. The world’s view toward entertainment is changing rapidly. Families aren’t all focused on one screen on family TV night. The coveted “TV viewing audience” has fragmented and advertisers are struggling to find a solution. LOGX is quickly becoming that solution. With a highly intuitive platform that gives advertisers exactly what they need at a time when they need it most, it’s hard to argue the value of PeerLogix and their patent pending audience discovery platform. This article was originally featured with all relevant disclosures on CNA Finance.